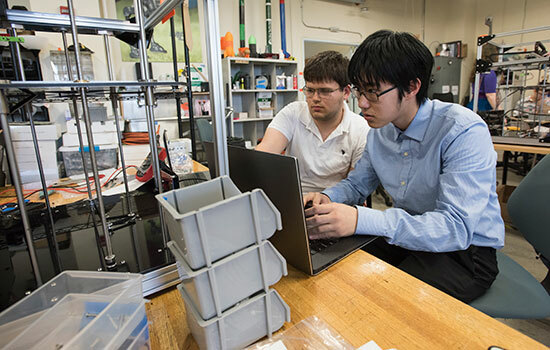 Chris Moriarty, left, and Kenny Kim work as a team to build a 3D printer in the three-week Career Ready Boot Camp to help RIT students with autism prepare for job interviews and work with others. It’s hard enough to prepare for a job interview, but when you have autism, which may include idiosyncrasies such as minimal eye contact during conversation, getting hired can be harder, even with excellent qualifications. Two new programs at Rochester Institute of Technology are helping students with autism prepare for interviews and land jobs. Eight students recently completed a three-week Career Ready Boot Camp, and RIT’s Neurodiverse Hiring Initiative has helped dozens of students network and find co-op work. The parents of a current RIT student with autism made a significant donation to help start the two programs, which will impact the graduation and employment outcomes of many of the 180 RIT students enrolled in the Spectrum Support Program or identify on the autism spectrum, said Laurie Ackles, director of RIT’s Spectrum Support Program. More fundraising will be needed to sustain the program at a high level, which may include stipends for living expenses during co-ops, coaching students in career readiness, building more opportunities for jobs through networking between students and employers, and increasing the number of students participating in the summer boot camp. In the pre-employment boot camp, students focused on soft skills, communication, teamwork, flexibility, time management, taking initiative, decision making, organization and presentation. They participated in mock job interviews and used their lessons by working in teams to build 3D printers. Kendra Evans, who created the camp’s curriculum and was one of its instructors, said each student determined what they could best use to help themselves improve their social skills. Evans said she witnessed “amazing growth” from the students almost immediately. 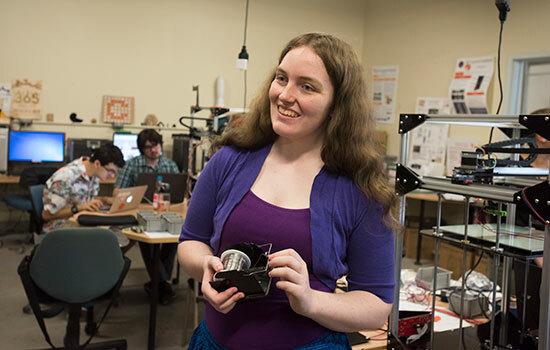 One attendee, Alaina Russell, an electrical engineering major from Boulder, Colo., had a 3.9 GPA as she completed her first year at RIT. She wanted to go to the camp because working with others was something that made her nervous, which might impact her ability to work with others in the future. She said the program helped improve her self-confidence. Kenny Kim, an undecided major from Deerfield, Ill., hoped the camp would be a good stepping stone to help him in a job interview, whether it was for a co-op or a permanent job. Like any college student, he wanted to learn how to write a résumé and leave a good impression with a prospective employer. He also worked well with his partner as they were the first team to get their 3D printer running. “I like learning about anything,” he said. Many of the local co-op opportunities are on the RIT campus, but some are with private employers. Second Avenue Learning in downtown Rochester hired two RIT students from the program at the end of May to work as game developers. 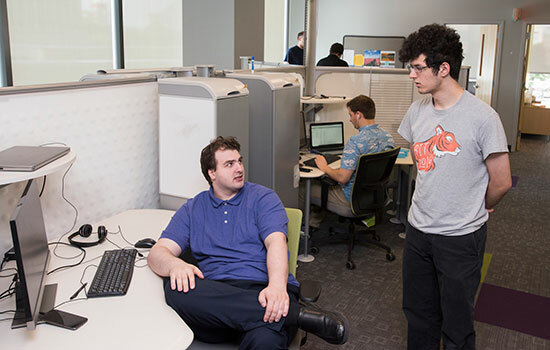 It is the first office job for Adam Ledet, from New Orleans, who will be entering his third year at RIT, and Chris Littlefield, of Greece, N.Y., who will be entering his fifth year at RIT. Both are game design and development majors. Tory Van Voorhis, Second Avenue’s CEO, said Ledet and Littlefield are fitting in well with her 22 employees, most of whom are also RIT students or graduates. She said they have discussed environmental accommodations and best communication options, have open spaces to encourage collaboration, closed rooms if someone needs to work in a quiet area, daily group walks and standup reports to colleagues to say what they are working on. Employers interested in finding out more about neurodiverse hiring may contact Janine Rowe, at RIT’s Career Services or visit rit.edu/neurodiversehiring. Those wishing to contribute to the work being done through the Spectrum Support Program or RIT’s Neurodiverse Hiring Initiative can visit the Spectrum Support Program website or contact Liam Welsh, director of development, at 585-475-6465.